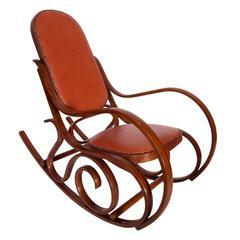 An incredible and unusual Art Nouveau bent sandalwood rocker. A beautifully-built, elegant and highly-unexpected construction, two 3' bentwood rings flank and support an unusually deep seat with concave back. Carved wood buttons at the seat and backside indicate this likely had a custom cushion making the form fully functional. Wonderful patina from age, great from all angles. Though gently restored and still rigid, the piece sits now more as an incredible, anonymous, turn-of-the-century rarity; extraordinarily evocative utilitarian sculpture. 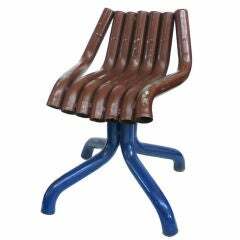 Extremely unusual chair made by an auto worker from tailpipes of recalled Ford Pintos. 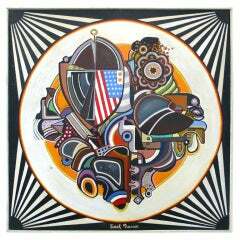 Whimsical and sculptural with a very playful and funky spirit. 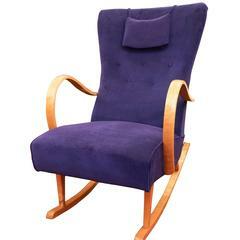 Crafted of solid birch and recently reupholstered in a lush purple velvet, the sprung seat, contoured back and attached head pillow offer exceptional comfort. 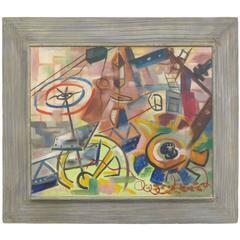 Vintage wood rocker. This chair is in wonderful condition, very sturdy, and will last another 100 years. 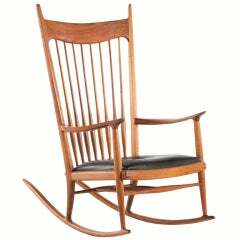 Beautiful and iconic rocker from noted California woodworker Sam Maloof. Spindled back.fine joinery details and leather seat. Signed with branded mark to underside of chair. 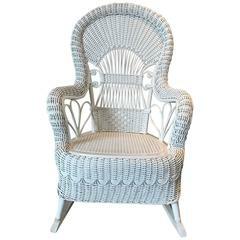 Beautiful Victorian Wicker Rocker in fresh white paint. 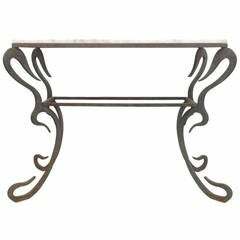 Rocker measures 26" wide, 32"deep (including rockers), 40"tall, 16" seat height.